For more than four decades, 31-W Insulation has been the home improvement company of choice for homeowners in and around Garner, North Carolina. We’ve cemented this reputation for ourselves by consistently providing our customers with top-of-the-line products and services. If you are looking to have a new garage door installed at your home, you can trust our team of highly-experienced technicians to get the job done right the first time. At 31-W, the premium garage doors that we sell and install are manufactured by Amarr®, one of the most reputable producers of garage doors in the nation. 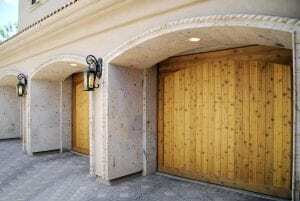 These garage doors are specially crafted from heavy-duty steel or aluminum to stand up to everything from daily wear and tear and forced entry attempts to extreme weather conditions such as snow, sleet, hail, rain, and more. What’s more, they require little to no maintenance and will retain their like-new appearance for many years to come. And, when you partner with 31-W Insulation to have your new garage door installed, you can trust our highly-trained technicians — all of whom are company employees — to complete the job flawlessly the first time. By never using subcontractors, we are able to ensure a higher level of quality craftsmanship and customer service with every job we complete. Moreover, you can enjoy total peace of mind as your new garage door will be backed by a one-year labor warranty along with a limited manufacturer warranty. To learn more about having a new garage door installed at your home in Garner, NC, or a surrounding area, contact 31-W Insulation today.